St. Mary church is holding this new fundraising idea to raise fund for the church projects. Hanna Botros and his team are preparing a Take-out dinner on Sunday Feb. 24. 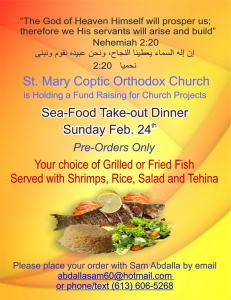 Please place your order with Samuel Abdalla (abdallasam60@hotmail.com, or 613 606-5258) ahead of time.